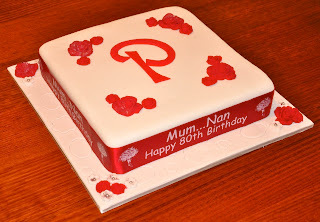 Today I delivered this cake to a lady celebrating her 80th birthday. Now my ability to write on cakes has never filled me with confidence so I tend to look for easier ways of communicating the message. You will notice the ribbon around the cake.Well the story is that I scoured the internet for a suitable product. I couldn't find anywhere in Australia who was able to help. The only place which Google turned up was in the UK - Rule Britannia - I say! Now Pearl was suitably impressed when I said I had sent to the UK for the said ribbon and more impressed when I said the quoted price would still remain the same. I know I can hear people say that I am a big softy!! !